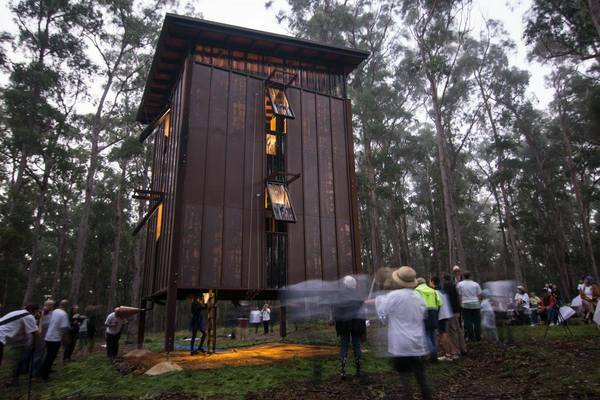 The Piano Mill at Willson’s Downfall just across the border from Stanthorpe has been recognised internationally with the award for Completed Buildings – Culture, at the World Architecture Festival in Amsterdam. The Piano Mill won out of a field of 15 shortlisted structures, which included cinemas, museums and China’s Zhuhai Opera House. Nestled in the forest on Harrigans Lane at Willson’s Downfall, near Stanthorpe, The Piano Mill is a unique architectural feature, homage to the musical history of outback Australia, and an “outrageous” musical instrument all in one. A square structure clad in copper, it was designed by architect Bruce Wolfe (Conrad Gargett) and is purpose-built to house sixteen pianos – eight on the first level and eight on the mezzanine. The walls consist of large-scale louvers, which can be opened and shut to alter the Mill’s acoustic. Sixteen pianos were sourced from the Brisbane, Stanthorpe, Warwick and Toowoomba areas. Many are quite serviceable, and even reasonably in tune, while a few are more dilapidated, with wonky keys and bung notes. Wolfe’s concept was that the pianos be kept in their original, “found” state, to evoke the weathered sound of the outback. (Clocked Out) created a new concert-length work, exploring the unprecedented sound potential of this new mega-instrument. Incorporating mass sound textures, nature-inspired soundscapes, and bits of nostalgic Australiana, Griswold extended his large body of piano and environmental works to new frontiers. Over Easter 2016, 16 pianists from the local area and interstate, directed by Vanessa Tomlinson, were invited to help bring to life this one-of-a-kind, living slice of Australian musical history at the official launch. Find out more at www.thepianomill.org and ‘Like’ on Facebook for upcoming performance and event information.